Is It Good? 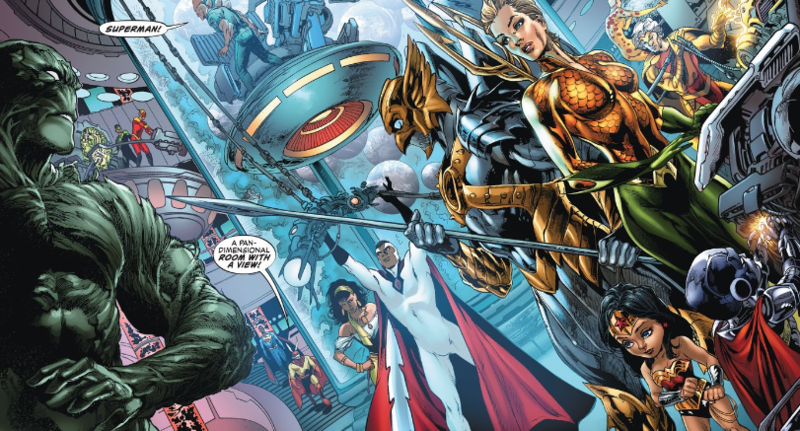 The Multiversity #1 Review – AiPT! Grant Morrison. That’s all you have to say about a book that’s written by the guy who hasn’t written anything in months. It’s also how you start a review about a comic that proposes that comic characters are real and the comic’s an actual window to other universes, because the man is very good at developing tongue-in-cheek, overly complex storylines with enough easter eggs from the DC universe to rival Easter itself. Sometimes though, his genius can be too much, creating a mess rather than a composed piece. So, is it good? This is one complex story, with stories inside stories, characters familiar to any Marvel reader popping up in alternate universes and a threat that’s so dangerous it could kill the reader. There are a ton of layers going on in this book, but this isn’t a study, it’s a review. That said, I’m sure some great essays will sprout up in the near future about how Morrison has woven together DC, and even Marvel, mythology into his series and made it his own. So don’t expect too much in regards to connecting the dots, but rather a critique. A hero who writes reviews? The book opens with a hero reading a comic (a horror comic to be more specific) that’s haunted and printed by DC. In the comic there are insects in a woman’s hair. He’s a multiverse monitor and appears to keep tabs on bad guys that threaten entire Earths. He flies in a spaceship that is made of frozen music and is off to rescue the last hero—or, as he calls himself, god—of Earth 7. The book then transitions to Earth 23 where the now semi-famous and fan favorite black Superman lives. He’s the president, and he’s uncovered something that leads him off to join a team of multiverse heroes. Nobody finds it alarming the adventure they’re on was printed already? Hurry up and read the trade so you can learn how to beat the bad guy! I can say without question this comic is fun and compelling. The amount of tidbits thrown in is spectacular, and with so much to digest two or three reads is not out of the question. The Superman of Earth 23 is also compelling for a variety of reasons, especially as he comes to grips with the idea that there are other Supermen, all of their lives being written in comics. It’s fun to see all the characters Morrison has come up with and uses from the DC mythos. The superhero rabbit known as Captain Carrot for instance, who seems to have powers of a cartoon character, is a fun little touch. It’s also interesting to see the very home base they enter appearing in a fellow character’s comic. All of that said, none of this feels grounded. A lot of this comic reads as if he’s thrown everything at the wall just to see how it sticks. In a comic where anything can happen and the rules break the fourth wall themselves it’s hard to take it seriously. That isn’t to say it’s not fun, because it is, and at the very least it’s interesting to see how characters we know and love are introduced with a slightly different look. Just to rattle off a few, I spotted Savage Dragon, Dr. Doom, The Fantastic Four, Captain America, Hawkeye and Ms. Marvel. They’re all side characters however, so don’t worry about a main character being anything but an alternate DC character. Hey, that’s the FF and Dr. Doom! The comic ends well too, with what happened in the beginning which was seemingly random, mattering by issues end. The threat is very real and clear and since almost anything can happen there’s no reason to not want to pick up the next issue. The art by Ivan Reis is quite good, with his usual attention to detail without a hitch. It’ll be interesting to see if he can hold up the quality of this issue into the following issues [Editor’s Note: each issue is drawn by a new artist], but for a first issue it’s right up there with an event book in quality and scope. I particularly like his design of Captain Carrot, who has a TMNT feel, but also an edge to him that’s almost scary, but still fun. Chalk that up to the dark ink work I suspect. These monsters remind me of Dial H.
This is one big fun meta comic book nerd extravaganza. The message by the end is clear: you, the reader are taking part in this adventure too, and the villains are laid out and the threat interesting. Clearly at the end of the day this book is about storytelling and if you’re a lover of stories and myths this will be right up your alley.